Mulberry tree on back of house. 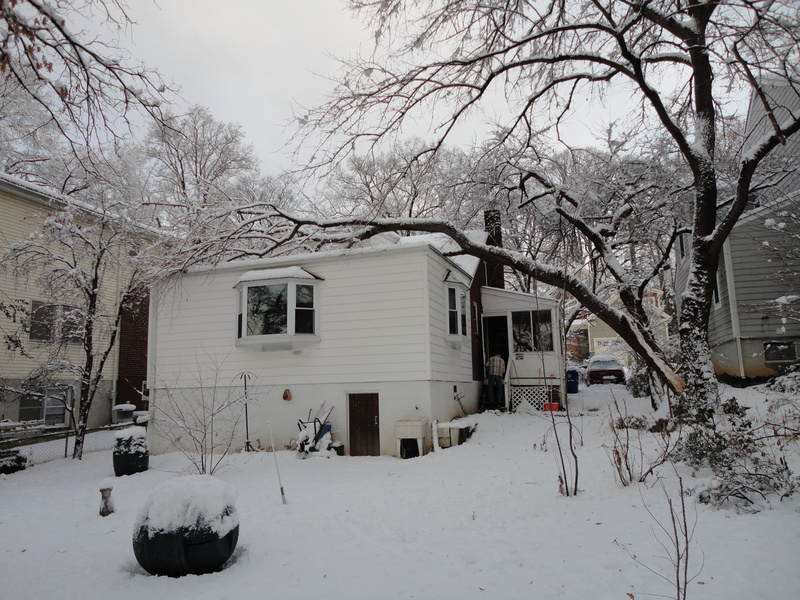 A tree fell on our house this winter; actually it was worse than that. Two trees fell on our house. In late January, we were sitting at the dining room table watching the heavy wet snowflakes blanket our backyard when a cracking sound was heard. Then came a series of heavy thuds above our heads. Outside our bay window, I could see the bottom part of the mulberry trunk but four-fifths was nestling on top of the house. 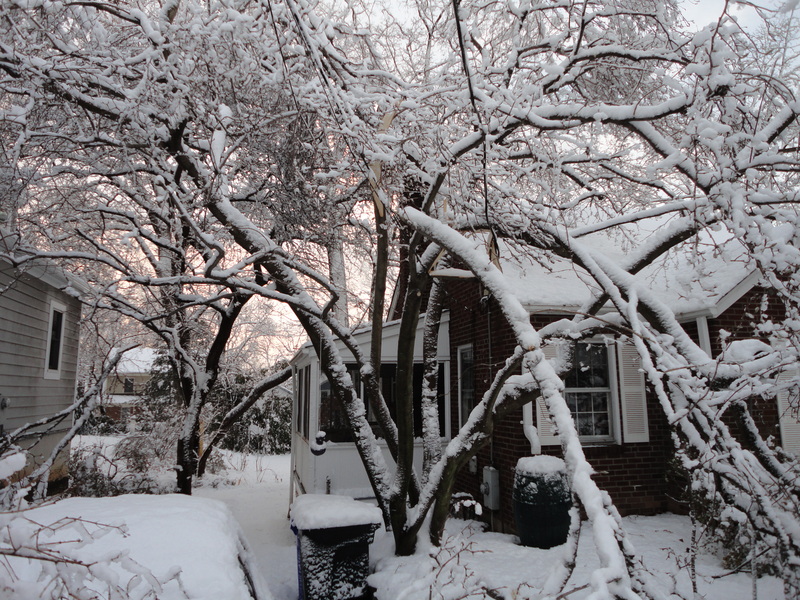 Within an hour, a second crash was heard to the front of the house and the saucer magnolia had two of its five trunks pulled down by the heavy snow. This catastrophe was not only expensive but it was embarrassing. You see, I’m a tree evangelist who is constantly preaching about the benefits of trees – they absorb stormwater runoff, they clean the air, they promote energy efficiency through shading, they help people feel better emotionally, and they even assist in reducing crime – now two could have hurt my family! I wanted to consult someone with more experience dealing with this dark side of trees so I called a Certified Master Arborist. He was reassuring. In twenty-three years of dealing with storm damages, tree diseases and natural aging, he knew of no personal injuries to homeowners from trees falling on houses – the half-dozen injury cases he’d seen resulted from homeowners attempting to take down a large tree by themselves or climbing it with an electric saw (Memo: don’t ever do this!). Storms happen; trees fall. We will be blogging about storm damage and trees over the next few weeks with suggestions on how to minimize damage and stories of others who lost trees and what they have learned for their replacement trees. Next post will be about the July 3 “macroburst” in North Arlington that resulted in 103 trees being damaged and removed from streets and sidewalks. •	Remove the target. While a home or a nearby power line cannot be moved, it is possible to move picnic tables, cars, landscape features, or other possible targets to prevent them from being hit by a falling tree. •	Prune the tree. Remove the defective branches of the tree. Because inappropriate pruning may weaken a tree, pruning work is best done by an ISA Certified Arborist. •	Cable and brace the tree. Provide physical support for weak branches and stems to increase their strength and stability. •	Provide routine care. Mature trees need routine care in the form of water, fertilizer (in some cases), mulch, and pruning as dictated by the season and their structure. •	Remove the tree. Some hazardous trees are best removed. If possible, plant a new tree in an appropriate place as a replacement. This entry was posted in Education, Tree Care and tagged arborists, storms, tree care. Bookmark the permalink.